I have been a long time fan of Michelle Coleman. 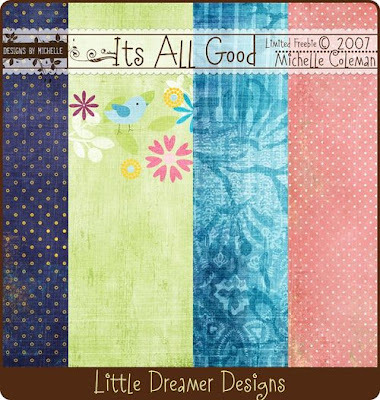 Back when she had her own store titled Second Mile Designs, then went to ScrapArtist, and now that she has her store, LittleDreamerDesigns, which she owns with her sister, Lori Barnhurst, formerly of Artist Artist, and ScrapsyDaisy before that! Wow, that is a lot of history! Anyway, she is supertalented and I just love, love, love her designs. Here is a little sampler to whet your creative appetite. Tequila Template and Mini Kit by Kim!